I'm looking to source a genuine navy blue nylon pakamac in size extra large....preferably new so any suggestions ? Thanks for the compliment,Gareth! An expert indeed! But today I had a beautiful sighting-an authentic navy blue nylon mac, pulsating with the wearer's every move. As you would expect, a somewhat older lady. Didn't get chance to speak, so there was no liaison, but plenty of inspiration! As for Isobel, she still remains my ultimate waterproof pin-up. Some months ago, on a very hot afternoon, I took some selfies of me in one of my navy Stay-Dry nylon macs, and these are on display on my Flickr site. The sun was so vivid, the mac appeared almost ROYAL BLUE! I was standing at the lake, near to Isobel's house, hoping she would appear, but not on this occasion. However, the whole leafy area remains my favourite haunt for outdoor macking. Rest assured, I do remain witnin the confines of decency! Till next time, happy macking to all of you! A Happy New Year to all the waterproof fraternity-let's hope there is as much rain as possible! Jamie has made an interesting comment about Pakamac hoods. The standard grey-black plastic macs of the 50s/60s were without hoods,to accommodate school uniform caps(yuck! )for the boys, and hats for the girls. Some of the other brands of plastic mac did have attached hoods, but most had separate rain bonnets, so beloved of Susan. Jamie do you still wear pac a macs? I also have very fond memories of the pakamac. My parents were rather strict when I was growing up, and one of their rules was that a pakamac would be my summer coat. I had to wear my pakamac whenever I set foot outside during the summer. On especially hot days, I was allowed to keep my hood down but most of the time I had to wear it up. Pakamac may be gone, unfortunately, but the tradition is kept going by "Stay Dry", "PVC-U-Like", and one or two others. One good thing about Pakamac is that they kept their prices very reasonable even though they were leaders in their particular field, and their successors have followed suit. Nor have they sacrificed quality-just try the PEVA macs of Stay Dry! A lovely contribution,John, congratulations and thanks very much. Like me, your enthusiasm was sparked by school rainwear. Although plastic macs were allowed as part of our school uniform, they had to be grey, grey-black, or black, to harmonise with the navy blue basic uniform. Because the girls preferred the more colourful macs, which were frowned upon, it followed that far more boys wore the standard plastic Pakamacs than girls. However, a few girls did have their own way, and I recall a beautiful see-through mac in a vivid emerald green, well worn. The colour was particularly striking, and was only equalled when Pakamac brought out their new range in 1977. They then referred to this colour as "jade". Hi new member here .I have just discovered the site and have very much enjoyed reading all the comments with interest bringing back old memories of when I was taken to get fitted for school rainwear or my sisters .In west London where I lived there were two shops that specialised in school uniforms one for boys and gents and the other for girls and both fully stocked pakamac plastic and nylon raincoats which were compulsory then at most schools in the area.So usually about once a year you were taken to get fitted, usually for a gabardine raincoat and a pakamac to fit over the top ,then you were fully measured for both so you got the correct fitting .Both the shops used to carry a very extensive range. Now long gone. An excellent contribution from Plasticjiffymac, outlining the agonies and ecstasies of waterproof enthusiasm. More and more I am going back to those early days of boy's plastic macs, and how I was so obsessed with them. At school, on wet days, I could hardly concentrate on lessons, knowing so many of them were hanging in the cloakroom, drying so beautifully. As I have previously implied, I hav9e no doubt at all on the veracity of Stories website. We waterproof enthusiasts must stick together and share as many experiences as possible. Maybe sharing macs too-a lovely thought. Jeff has mentioned the possibility of displaying my items in a museum-again a wonderfully creative idea. My great friend/contact/near-partner, Susan, has not only marvellous wardrobes of plastic and nylon macs, but also a wonderfully comprehensive knowledge of such items. It would not surprise me at all if the Stories website did not belong to her. She has some great male plastic Pakamacs too. And, Sue, if you are reading this, please let me have your phone number once more. I accidentally deleted it, hence my not being in touch. The comments are good, but the macs themselves would be even better. I will not rest until I have acquired a genuine, grey-black, see-through, late 50s/early 60s plastic Pakamac, from the original Chadderton factory. There must still be a few around somewhere. Susan and Plastic Pakamac/Stories, real professionals! And no, I haven't read any of your material, Plastic Pakamac, but when my e-mails are sorted out, I will be investigating your resources further. Just caught up with the latest updates. Fascinating and I'm interested in contacting Pakamac. I am not associated with his work but as you imagine, very interested. It is possible though, that a few rather badly written stories of mine were seen on my old yahoo website, now defunct for some time. It is possible, who know with the internet? My more recent works have been produced over the past eight years now, and a great deal of effort in recording them as audio books, in as a professional a way as possible, has gone into my self set task, eight full chapters in all, each lasting thirty to fifty minutes. But anyway, this first of my books is based on my very real history, it is not fiction, and if you really would like to hear the whole of the first book, of which there are many, all you have to do is to send an email using a proper email address to pakamac@mail.com. And I will then point you to where I have stored the files. I do hope that anyone who hears them will leave criticism of my work, for it is quite hard doing such a thing without a mentor. Again, if you would like to contact me, please use pakamac@mail.com. I Look forwards to reading some comments. I too tried the address from my gmail account and was so pleased I did. The link does not provide direct access to the stories, you need more information before you can can do that, a real email address, to protect the writer from some rather less than honest people. But the stories really do reflect such feelings about Pakamac rainwear, especially a poor lads coming to terms with such a thing, as well as the tragedy that enfolds. I just went to the web address given and having provided a contact email was sent the whole book of the first series, in audio form, MP3s, an excellent work, and there is nothing suspiciouse about it at all. Perhaps you did something wrong, so maybe you should just keep on trying. So if any of your would like to know more, please contact me at pakamac@mail.com. I promise this is not spam or anything, and I would love to share my thoughts about such things. Hi Brian, Have you ever thought of opening a museum where you could exhibit your huge collection of macs ? I would be a regular visitor. Entry restricted to mackintoshed visitors only, of course. Kendal are certainly "in the news"! I have fond memories of our Birmingham Bull Ring branch, and I still have all those see-through jelly jackets. Some were made by Kendal themslves, whilst the rest were manufactured by Pakamac, albeit when fashioned in Taiwan. Mention of Kendal makes me remember other retail outlets which I used regularly in the 1980s-Faiman, Richards, Etam, to name but a few. And then there was the late, great C & A, with their wonderful ranges at such reasonable prices. I bought my Adrina nylon mac from there, one of my most prized items. 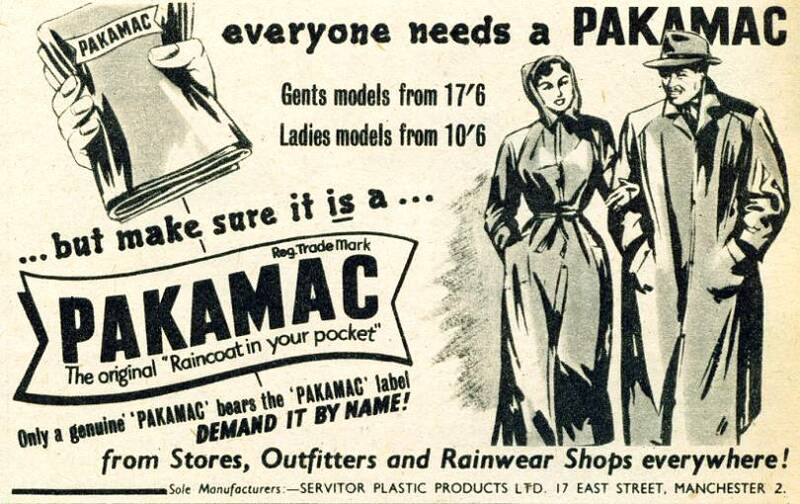 I could write a book about this pakamac alone-another "waterproof love story" yet to come. Watch this space! And, yes, Gareth, I have retained all my items, which currently number 950+. The reason for this large tally is down to Susie Boult, of the former Plastique Unique. She maintains she had 1500 items, and if she can do it, so can I! Susie is one of my waterproof mentors, and her Galleries on the Plastique Unique website are an inspiration to us all. They are also proof that there are genuine female rainwear enthusiasts, they just need tracking down. If it's the same Kendal that had a shop in Pontypridd in the late 1970's then I certainly remember them and the lovely see-through plastic poncho that I bought there; I still have it today although it's gone yellowy. Hi Chris, thanks for your comment on my macs. Any chance of some details of the plastic macs you bought ? Hi Brian good to hear from you often think when passing Birmingham on the M6 of you and the wonderful collection of macs you have what is the count to date? Gareth has mentioned Kendal. I once bought several see through plastic jelly jackets from them, in one go, and the girl asked me if I was going on a boating trip! We all have our own, unique waterproof experiences, our own waterproof Love Stories, to adapt those Tesco advertisements. We stayed in a cottage close to Aberaeron and went into Aberaeron a couple of times and New Quay. Very enjoyable. Well, my see-through plastic mac certainly had some use over the past fortnight ! Wore it for most of the day on Sunday in Ambleside and Coniston and also a lot of the time on a Hebridean island, followed by a wet day in West Wales. Now looking forward to a couple of days in Blackpool to top it off. Having bought six nylon macs, one PVC Mack and eight plastic macs this year, an onlooker may well describe this period of time as period of almost a resurgence! OK, it's not the hay-day Pakamac years but with Amazon, eBay and the pvc-u-like offerings plus the Rainmac sale, I'm certainly celebrating. This year, I discovered black EVA plastic macs. I'm hooked. OK, no lovely plastic aroma but the weight, sound, feel and look is fabulous. Hi Jeff. It is nice to hear about your holiday. Wherever you are going in the lake district and then Scotland I am sure you will have a nice time. I think you are right you might have a lot of rain especially on sunday but it sounds like you are prepared for it and so hopefully you can sill have a nice time even if it rains all the time! And if you like gardens there are some really lovely ones in Scotland. We are off to the Lake District on Saturday and then on to Scotland. According to the weather forecast I will be wearing my plastic mac most of the time. Hi G, the sight of your teacher in her plastic mac obviously remains very clear in your mind as does my memory of my sister in her pale blue translucent plastic mac which had a matching belt and a matching concertina style rain bonnet with ties that were tied under the chin. Happy days. If anyone is visiting Edinburgh, it's always a good idea to look in the tourist shops on the Royal Mile. I've seen plastic macs on sale there quite recently. Those memories of Blackpool remind me of all the plastic macs in shops in Skegness. The Lake District was always goood for plastic macs. So was Aberdeen a long time ago. Hi Jeff my wife's mac is clear but as you said it is semi see through. If you are going to Wales, the lake district and then Scotland I think you are right you will probably need yours. Thanks for the reply. Your wife's plastic mac sounds nice; may I ask what colour it is ? My friend sent me a photo of the packaging of the macs he has ordered and, although they are unisex, it shows a photo of a lady wearing a clear see-through mac. It didn't occur to me that they may be black. We are off to Scotland with them soon so I should be able to let you know. My wife and I are also going to the Lake District and New Quay, west Wales over the next few weeks so I am expecting my plastic macs to get some use. Yes, it's a shame that we don't see plastic macs for sale in the shops these days. I used to particularly enjoy being taken to Blackpool when I was young and most shops would stock them and many would hang them outside on display, flapping in the wind; a lovely sight. MY wife never really liked plastic macs but tolerated them for my sake. Like most women, I suppose she feels comfortable wearing what other women are also wearing, not wanting to be classed as "odd". Hello G, I certainly consider myself extremely lucky that my wife tolerated macs for about 15 years or more, As you say, I did get accused of liking macs more than her. I accept that women are unable to understand how strong the attraction to macs can be. However, I had this fascination from a very early age and it has never left me. Hi Jeff yes my wifes plastic mac is basically transparent but it doesn't look completely see through when its on so I think semi see through is a really good way of saying it thank you. My black Go mac is probably like your friends one. We are the same as you really we like them because it is easy to fold them up and just carry them and put them on when it starts to rain. It sounds like you have really needed yours on your holidays! I wonder why your wife doesn't like hers anymore. my wife wears hers a lot when it is raining and a lot of ladies ask her where she got it. It is a shame you cant buy them in the shops like you used to but perhaps you can still buy them in wales. Thank you for your nice comment it was nice to hear about your holidays perhaps you can write some more about them. We went on a railway when we were in Porthmadog two weeks ago and it really rained on us that day as well. I confessed my liking for plastic macs to my wife early in our courtship and she had no problem with it. After about 12 years of marriage she became less tolerant. She would rather me not wear my see-through mac when we are out in the rain but I enjoy it so much. Hi Jeff good to hear from you passed your area today on my way to Swansea didn't see any one wearing a plastic mac sadly may I ask what does your wife make of your love of plastic macs?